Finding the silver lining in a quarter that exceeded expectations, yet was still unprofitable. 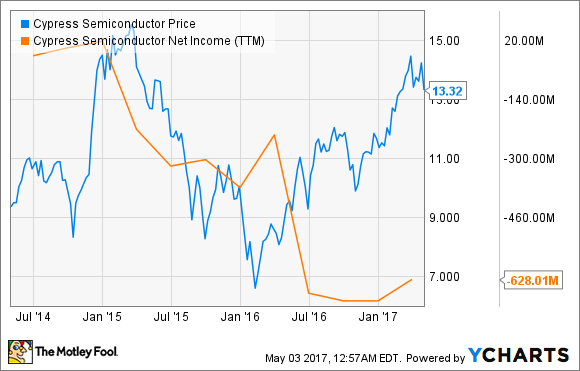 On April 27, Cypress Semiconductor (NASDAQ:CY) reported results for the first quarter of 2017. The company says it has been successfully executing on its Cypress 3.0 makeover plan, and sales reinforce those statements. Bottom-line black still proves elusive, though. At the beginning of the year, Cypress said revenue in the first quarter would total between $495 and $525 million. That guidance was surpassed, with actual revenue coming in at $531.9 million and setting an all-time first-quarter record for the company. Gross margins also came in at the high end of guidance, hitting 37.4% as cost savings from its merger with former competitor Spansion in 2015 continue to yield results. 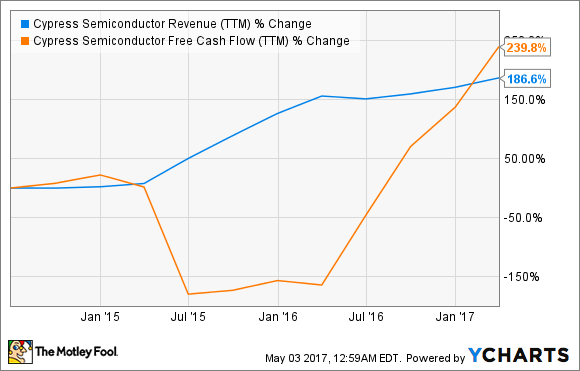 Those higher margins also led to a beat on the bottom line, with earnings per share of -$0.14 besting guidance of -$0.22 to -$0.18. Profitability remained elusive, prolonging a trend of red that began in 2015. The cause of the losses has mainly been restructuring costs and related overhead, which were acquired during the aforementioned Spansion deal and the purchase of Broadcom's Internet of Things business last summer. However, those increased expenses are beginning to abate, and the company sees losses narrowing further in the second quarter thanks to yet higher revenue -- $530 million to $560 million -- and margins improving again to 39% plus or minus 0.5%. Cypress underwent transformational change in the last two years as it invested heavily to remake its product offerings. The new company strategy, dubbed Cypress 3.0, is focused on emerging semiconductor technologies that are growing above the industry average. The company has sharpened its focus on wireless connectivity, though its USB-C power management and microcontroller divisions still represent key areas of growth as well. Leading end clients are in the consumer electronics industry and automotive industry, the latter of which has become the biggest revenue generator. Cypress' new PSoC 6 MCU designed for IoT applications. Image soure: Cypress Semiconductor. Over the last few months, the company has made more headway in reshaping how it does business. It sold its subsidiary wafer fabrication facility in Minnesota back in March for $30 million, in line with plans to slim down costs. Cypress then announced a new microcontroller for the IoT industry that claims bragging rights as the lowest power available for a broad range of devices. A couple of days after that, the company also said Continental had selected its automotive microcontrollers in its development of next-generation electronics for cars. The changes the company has made are beginning to pay off as revenue is quickly ramping up. The first quarter is usually a slow one for Cypress, historically down 6% to 7% from the fourth quarter, according to management, but this year, it was up slightly. The IoT business specifically was up 30% quarter over quarter. Obviously, there is still some work to be done as Cypress irons out the wrinkles associated with the recent acquisitions. But the quarter was a lot better than it may appear on the surface. Free cash flow, or money left over after operational expenses are paid for, is soaring. That's an indication that a rebound is underway. Even though profitability remains elusive, that free cash flow metric should keep optimism intact. And with the company forecasting another big sequential increase in sales next quarter, it looks like that trend could continue.